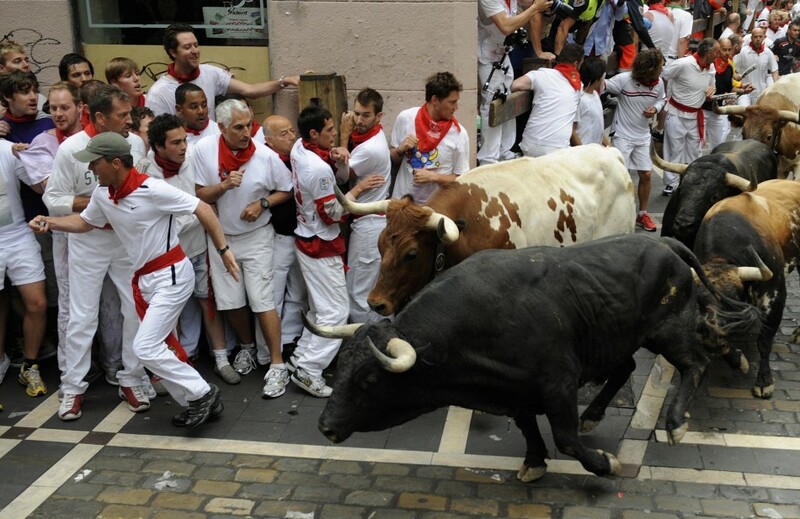 This morning (7/7/13) marks yet another “Running of the Bulls” in Pamplona Spain as part of the week-long celebration that takes place every year (7/6-7/14) and the main event of the San Fermin Festival. The first running is on the 7th at 8 A.M. and will continue each morning until the 14th. Participants must be at least 18 years of age, run in the same direction as the bulls (duh), not incite the bulls (duh again), and NOT be under the influence of alcohol…they do this sober? The rumble through the streets of Pamplona consists of four streets of the old part of the city (Santo Domingo, Town Hall Square, Mercaderes and Estafeta) and a section called Telefónica before entering into the bullring. The course is 903 yards, and the run takes about 4 minutes from corral to bullring. Bulls reach a speed of 15 mph as they make their way down the streets. The herd consists of six bulls, six steer, followed by 3 more steer 2 minutes after the initial 12 are released. As for the runners, they dress in the traditional clothing of the festival which is a white shirt and trousers with a red waistband and neckerchief. 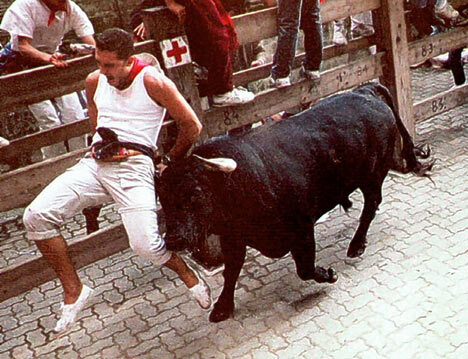 Their only means of “defense” from a charging bull (if you want to call it that) is a rolled up newspaper of the day. 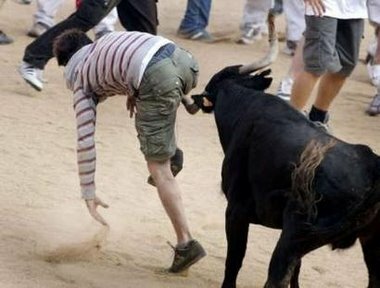 Once the bulls make it to the bull ring the Matador enters, bull-fight begins, and the eventual slaughter of the bull. This procedure is basically the same since the 14th century when this was a simple act of transporting bulls for slaughter. 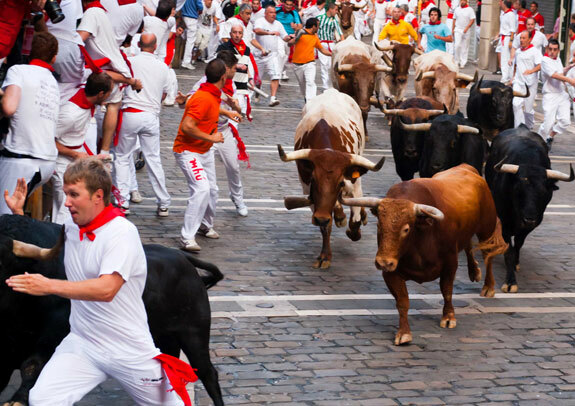 It only became an event and an eventual festival of Sanfermines in honor of San Fermín in the late 1800’s. Since records were kept in 1910, 15 people have been killed and thousands injured (200-300 a year) most of them not serious. Spain would be cool place to visit, but this definitely NOT on my bucket list. This entry was posted in recreation, sports, Uncategorized and tagged bull-fight, madator, Pamplona, Running of the Bulls, San Fermin Festival, Spain. Bookmark the permalink. ESPN or some sports station should air the event live so we can watch! I bet they would get some good ratings.